he third grand slam of the season gets underway at Wimbledon on 3rd July with the big four - Federer, Murray, Nadal and Djokovic - favourites to secure the title. Who will leave the All England Club as Wimbledon champion this year? 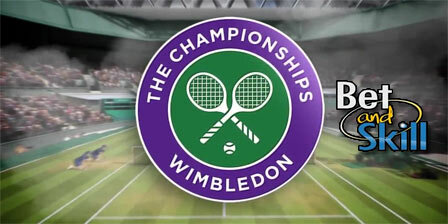 Check out here our Wimbledon betting preview with tips, predictions, enhanced odds, no deposit free bets and bookie promotions! Roger Federer has regained his grass court pedigree with his ninth title in Halle last week and enter the tournament as no.1 favourite despite his age (35yo). Roger's 26-5 record in the last two years on the surface is only inferior to the out of form Andy Murray. The Swiss maestro made the semi-finals at SW19 last year while he was injured and he is playing some of the best tennis of his career at the moment. Rafa Nadal has won his tenth titles in Monte Carlo and Barcelona this year and secured "La Decima" at Roland Garros last month, taking his grand slam titles to fifteen, second only to Federer. The Spaniard last made the final at SW19 in 2011, where he lost to Djokovic in four sets, and in the nine matches he’s played at the venue subsequently has just a 5-4 record. World No. 1 Andy Murray has been struggling with injury and illness all season and he is the no. 4 in the betting. Losing in the first round at Queen’s last week was a blow, but if he comes into the tournament fresh and injury free. The Brit is a two-time champion here and his game suits the grass, going 20-1 on the surface in the past two seasons. Marin Cilic has been in great form of late, reaching the Queen’s final last week. His style is perfectly suited for Wimbledon and the 2nd quarter is relatively easier. Milos Raonic, last year’s runner-up, will be looking to go one step further this year and claim a maiden grand slam crown. Raonic has struggled in recent months, and looked far from fully fit in defeat to Pablo Carreno-Busta in the French Open last month. Stan Wawrinka and Dominic Thiem are yet to shine at Wimbledon in their career but they look better on clay, rather than on grass. Wawrinka’s record on quicker surfaces has been brought into question previously, and he’s never won a grass-court title, reaching only one final in his entire career. Alexander Zverev has not beaten a top 50 player in a best of five sets match in his career, while Nick Kyrgios has retired from the tournament just before the start on Monday. Jo-Wilfried Tsonga, Tomas Berdych, Feliciano Lopez and John Isner will all be tough to break in matches, with all four players boasting a strong serve. They could be the dark horses of this year's tournament. Mischa Zverev, who has serve/volley style virtually made for grass, is another player who could go deep in the tournament as well as big-server Tomas Berdych. "2017 Wimbledon betting preview, predictions, odds and free bets"